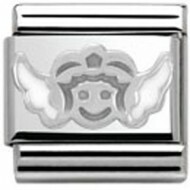 Composable Nomination Classic Angel Face Charm Silvershine, a stainless steel base link with Silver and Enamel. 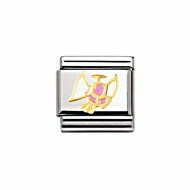 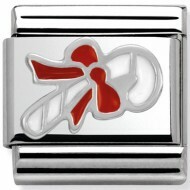 Composable Nomination Classic Angel With Red Enamel Charm, a stainless steel base link with 18ct Gold and Enamel. 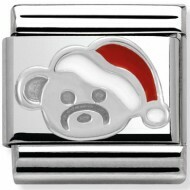 Composable Nomination Classic Bear With Hat Charm Silvershine, a stainless steel base link with Silver and Enamel. 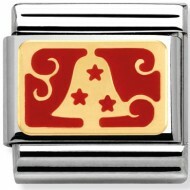 Composable Nomination Classic Bell With Red Enamel Charm, a stainless steel base link with 18ct Gold and Enamel. 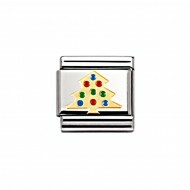 Composable Nomination Classic Candy Cane Charm Silvershine, a stainless steel base link with silver and Enamel. 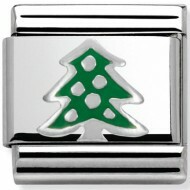 Composable Nomination Classic Christmas Tree Charm, a stainless steel base link with Silver and Enamel. 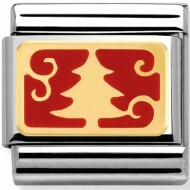 Composable Nomination Classic Christmas Tree With Red Enamel Charm, a stainless steel base link with 18ct Gold and Enamel. 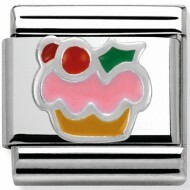 Composable Nomination Classic Cupcake Enamel Charm Silvershine, a stainless steel base link with Silver and Enamel. 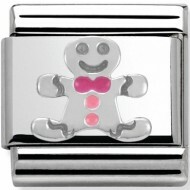 Composable Nomination Classic Gingerbread Man Charm Silvershine, a stainless steel base link with Silver and Enamel. 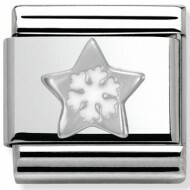 Composable Nomination Classic Glove With Snowflake Charm Enamel Silvershine, a stainless steel base link with Silver and Enamel. 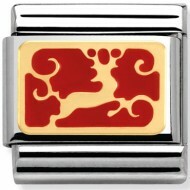 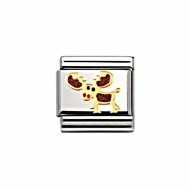 Composable Nomination Classic Gold and Enamel Animals Moose Charm, a stainless steel base link with 18ct Gold and Enamel. Composable Nomination Classic Gold and Enamel Animals Penguin Charm, a stainless steel base link with 18ct Gold and Enamel. Composable Nomination Classic Gold and Enamel Animals Polar Bear Charm, a stainless steel base link with 18ct Gold and Enamel. 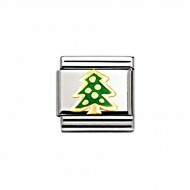 Composable Nomination Classic Gold and Enamel Christmas Christmas Tree Charm, a stainless steel base link with 18ct Gold and Enamel. Composable Nomination Classic Gold and Enamel Christmas Flying Angel Charm, a stainless steel base link with 18ct Gold and Enamel. 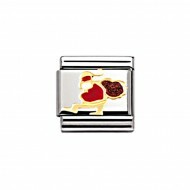 Composable Nomination Classic Gold and Enamel Christmas White Angel Charm, a stainless steel base link with 18ct Gold and Enamel. 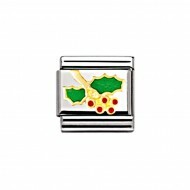 Composable Nomination Classic Gold and Enamel Christmas Holly Charm, a stainless steel base link with 18ct Gold and Enamel. 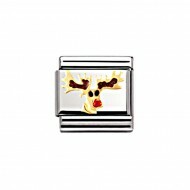 Composable Nomination Classic Gold and Enamel Christmas Rudolph Charm, a stainless steel base link with 18ct Gold and Enamel. Composable Nomination Classic Gold and Enamel Christmas Santa Claus Charm, a stainless steel base link with 18ct Gold and Enamel. 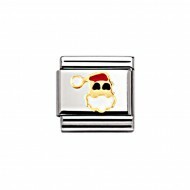 Composable Nomination Classic Gold and Enamel Christmas Santa Claus with Sack Charm, a stainless steel base link with 18ct Gold and Enamel. Composable Nomination Classic Gold and Enamel Christmas Sleigh Charm, a stainless steel base link with 18ct Gold and Enamel. Composable Nomination Classic Gold and Enamel Christmas Snowman Charm, a stainless steel base link with 18ct Gold and Enamel. 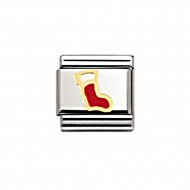 Composable Nomination Classic Gold and Enamel Christmas Stocking Charm, a stainless steel base link with 18ct Gold and Enamel. Composable Nomination Classic Gold and Enamel Christmas White Shooting Star Charm, a stainless steel base link with 18ct Gold and Enamel. Composable Nomination Classic Gold and Enamel Christmas White Snowflake Charm, a stainless steel base link with 18ct Gold and Enamel. Composable Nomination Classic Gold and Enamel Christmas Yellow Shooting Star Charm, a stainless steel base link with 18ct Gold and Enamel. 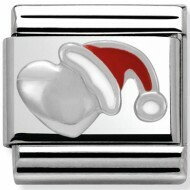 Composable Nomination Classic Heart With Christmas Hat Charm Silvershine, a stainless steel base link with 18ct Gold and Enamel. 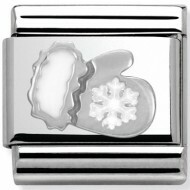 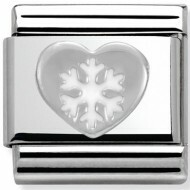 Composable Nomination Classic Heart With Snowflake Charm Silvershine, a stainless steel base link with Silver and Enamel. 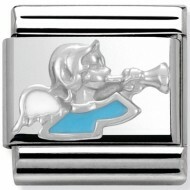 Composable Nomination Classic Light Blue Angel Charm Silvershine, a stainless steel base link with Silver and Enamel. 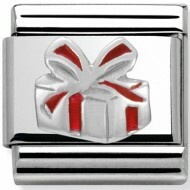 Composable Nomination Classic Red Gift Box Charm Silvershine, a stainless steel base link with 18ct Gold and Enamel. 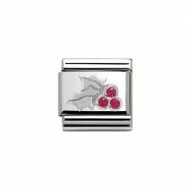 Composable Nomination Classic Red Holly Charm Silvershine, a stainless steel base link with Silver and red Cubic Zirconia’s..
Composable Nomination Classic Reindeer With Red Enamel Charm, a stainless steel base link with 18ct Gold and Enamel. 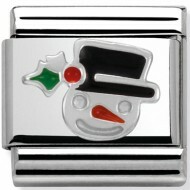 Composable Nomination Classic Snowman Face Charm Silvershine, a stainless steel base link with Silver and Enamel. 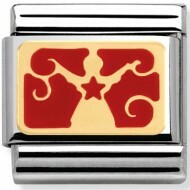 Composable Nomination Classic Star With Snowflake Charm Silvershine, a stainless steel base link with Silver and Enamel. 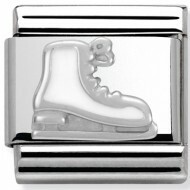 Composable Nomination Classic White Enamel Ice Skate Charm Silvershine, a stainless steel base link with Silver and Enamel.